The fire was contained thanks to quick-thinking sailing club employees, who moved neighbouring vessels away from the burning yacht, which prevented the flames from spreading. No one was injured in the blaze, and it’s not clear yet how the fire started. That’s why today, we’re talking about the importance of boating fire safety. It may seem counterintuitive to worry about fire safety on a vessel surrounded by water. But, the volatility of marine fuel, and the danger of being isolated from land, is inherently dangerous. 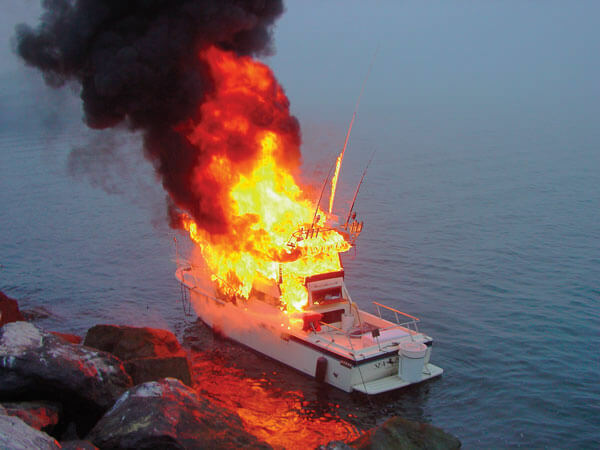 All boat operators need to know what to do, if a fire were to take place. This includes having the right fire safety equipment and knowing how to use it correctly. Ensure that you and your crew understand and are aware of your vessel and its capabilities. Make sure a smoke alarm is installed in an area that is close to where you sleep and far from fumes. Have a fire extinguisher located near an exit point or controls, as well as a fire blanket near the galley. Devise a ‘fire escape plan’, which takes into account every person on board, and whether you are moored or at sea. Make sure every area is well-ventilated, especially if the motor is on. When refuelling, isolate ignition sources and allow motors to cool off. Make it a habit to inspect the exhaust system and fuel lines for leakages. LPG cylinders should be stored in ventilated spaces. When appliances are not being used, ensure they are turned off. Cylinders should be ‘in test’ and fittings and hoses should be protected from corrosion (caused by salt). Don’t forget that LPG flows in the same way that water does, which means it can build up in the bilge. Ensure electrical equipment is regularly maintained, as a high volume of fires are caused by electrical faults on vessels. Never operate electrical equipment or switches in the presence of flammable vapours. Are you covered for fire? If you’re not sure whether you’re adequately insured for fire damage, or would like your existing cover reviewed, please talk to us. We offer comprehensive marine cover that takes care of you for the stuff that matters, so you have peace of mind, should the unexpected occur. Get started now, and for more information on fire safety on a boat, please head here.